If you want to share URLs with your students, tag your del.icio.us bookmarks with a module code. If you publish the link to the tag, your students will get up-to-date access to your links and it’s easy for you to add more. I find it much more more flexible and convenient than the External links feature in Blackboard! You can even create an RSS feed for your links! Here’s one I made earlier: del.icio.us/cpjobling/eg-146. In my previous article in this series, I described how I use the All Items mode in Google Reader to efficiently wade through a large number of articles from my subscribed-to RSS feeds. In this article I show you how I mark, bookmark and occasionally blog about interesting items that I find in my daily news. The underlying justification for this process is an attempt to supplement my memory with minimum effort! Enjoy, and don’t forget to leave a comment! 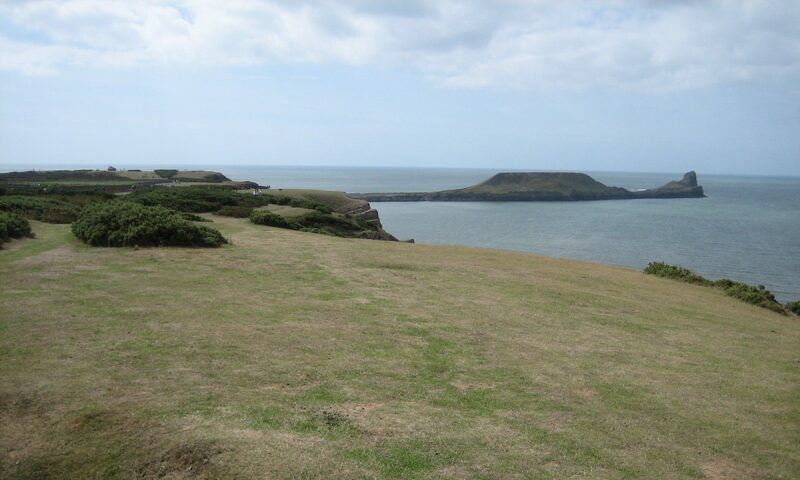 The web2.0 method of coping with information overload is to use tagging and folksonomy to aid in the categorisation and recall of information. However, these methods are equally applicable to personal information management. I find that I have developed a three-stage approach to managing my RSS feeds. Firstly, I supplement my short-term memory by marking interesting items using a method that makes it nearly effortless to commit such items to memory. Secondly, I use my del.icio.us bookmarking site as a long-term memory where I can tag items that I want to be able to recall again. Finally, if the item is worthy of more reasoned commentary, I’ll blog about it. All forms of memory, because they rely on web2.0 technology, provide RSS feeds that make it easy to share my memories with you dear reader. The rest of this article describes this process in more detail. 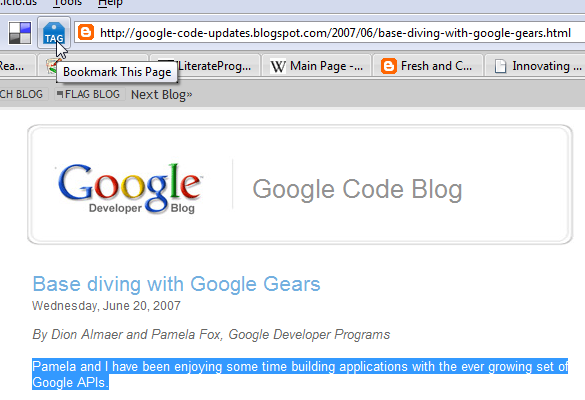 The easiest and quicker way to tag an article as worth remembering in Google Reader is simply to mark it with a star. Starred items provide a sort of short-term memory for me as it requires virtually no effort on my part, and can be done during the act of reading. The primary advantage of supplanting my short term memory with a Google Reader starred item is that of course, like women and elephants, Google never forgets! Thus I can easily go back to my starred items from the navigation panel and read them all again. To star an item, you simply click in the star icon. Alternatively, if you prefer to avoid the mouse, typing s will toggle the star. And that’s it: remembered! p>Typically, if I find an article that I think deserves tagging, I’ll open it in a new browser tab. You do this in Reader by clicking on the article’s headline (which is a link to the real article’s permalink) or typing v for view. To tag and bookmark this article for easier recall, I will often select a key sentence in the article then press the Tag button in my browser. In the pop-up Add Bookmark window, the selected text will appear in the Notes field. I have edited it here to change it from first person to third person and add a little more information. I also add some tags. Then I save the bookmark. 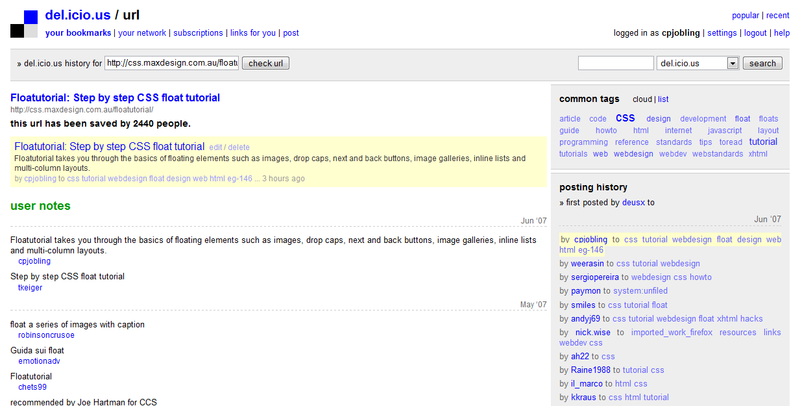 The article itself may itself contain useful links, so I’ll often follow these and add additional bookmarks and tags. To find an article later, you simply go to your bookmark collection and search for the tags. 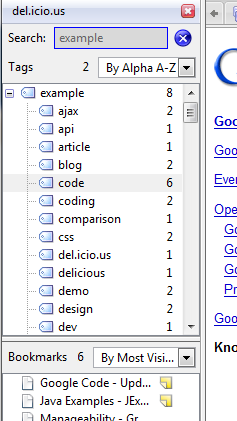 In Firefox, I can do this directly in the del.icio.us replacement for the built-in bookmarks. A major benefit of del.icio.us tags is of course social bookmarking. 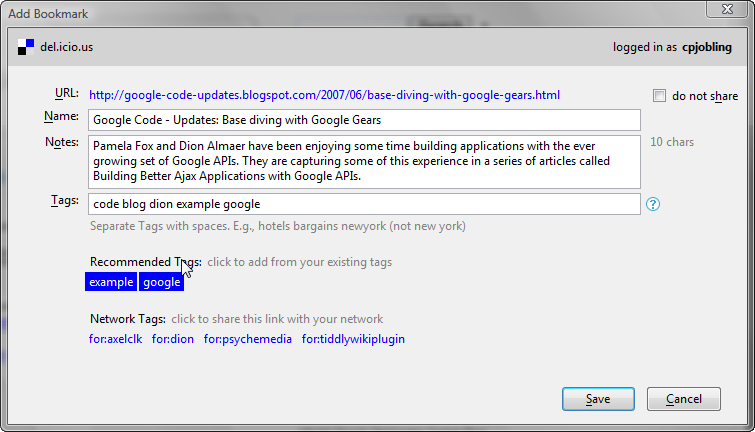 Bookmarks are tagged by other people, and by following their tags you can find related articles. This works best from your del.icio.us homepage. John Udell published a nice screen-cast on this some time ago. I looked up the link in my bookmarks collection which you can find on-line at del.icio.us/cpjobling. Blogging is hard! Finding an article that is worth some serious comentary is relatively rare, and when you do find one, it’ll take some time to compose, proof read and publish. I find that starring items and bookmarking a subset of these is sufficient to commit most of what I read to memory. And I automatically get the equivalent to the link blogs that some people produce, by performing the actions that I’ve described in this article. Why I decide to write a blog article and the tools that I use to do so will have to wait for another article. 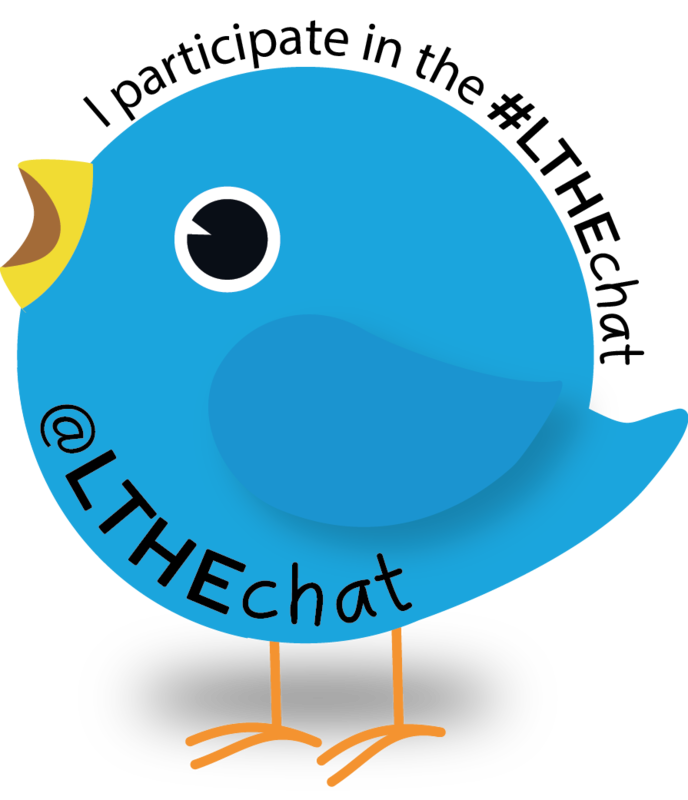 I think it’s worth concluding with a few thoughts about how I share the articles that I’ve marked interesting, bookmarked or tagged. An advantage of Google Reader is that it provides an RSS feed for starred items and I use this to embed my starred items in the side panel of this blog (See What’s tickling my fancy on the right of this article). This is a really easy way to provide the equivalent of a Link Blog and share interesting things with my readers without any editorial. An alternative way to mark items for sharing is to use the share icon which appears at the bottom of the article view. But I find this less convenient because you have to scroll to the end of the article to find it. The star is at both the top and bottom of each article, so there’s no need to scroll if you can make a decision on the first screenful of the article. I guess that share is intended to be used for the public sharing of interesting articles, whereas the star is meant to be private. However, as you can easily make starred items publicly visible, I find this distinction bogus. This is Part 2 in a planned series of essays on living life online. Part 1 is here. The whole series is tagged mylifeonline for ease of access. In the previous article I showed you my Firefox start up page. In this article I’m going to drill down into my iGoogle portal concentrating on a typical news reading session. I will be showing you how I use my RSS feed aggregator to efficiently find out what’s new across a large number of subscribed-to blogs and other RSS feeds. 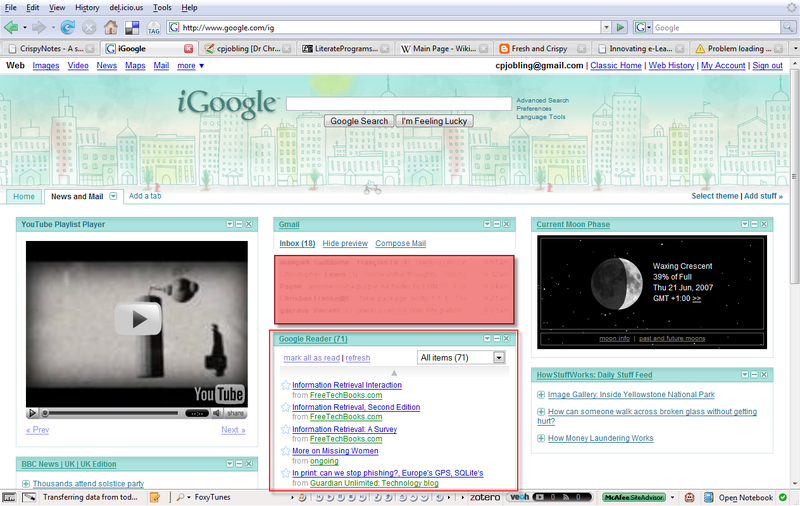 This picture shows my iGoogle news page in Firefox (click the image to enlarge to full size). 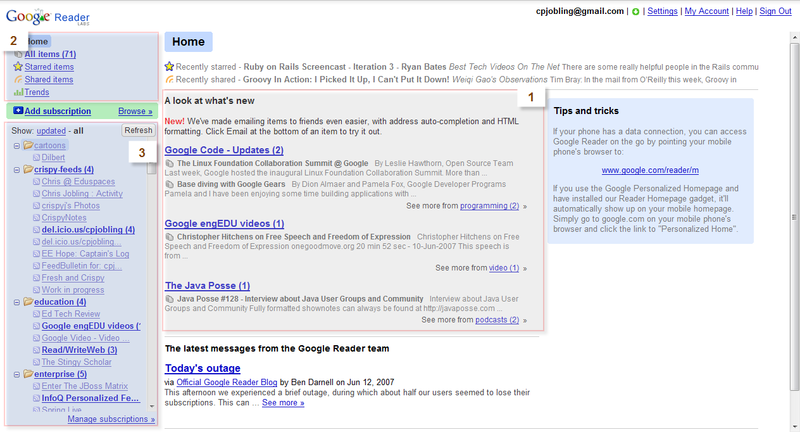 I’ve highlighted the Google reader panel. You can see that today I have 72 new articles to read. I can read articles within the iGoogle window, but it’s usually more efficient to go to the Google reader web application which has more reading options. So I click on the Google Reader link to open the Google RSS Feed Reader. 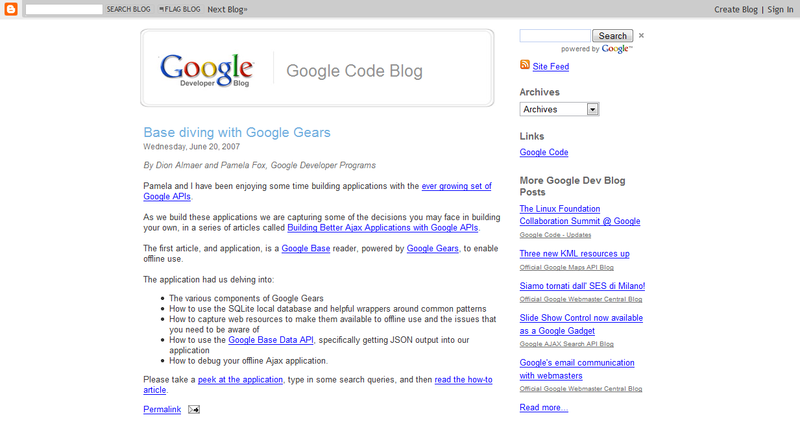 The Google Reader web home page has three main areas. The main area(1) gives a selection of the unread items which is based on what Google Reader thinks are the topics that I’ll be most interested in. On the top left is a navigation panel (2) which gives me quick access to the home page, all news and items that I’ve chosen to mark as important (starred) or those which I’d like to share. The third area (3) gives the traditional folder view of the RSS feeds that you’ll find in most RSS feed aggregators. Google Reader differs here in that folders represent tags and so you can conveniently place a single RSS feed in more than one folder. 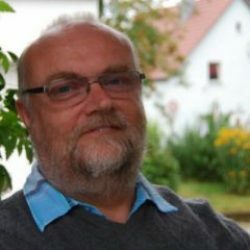 For example I have Alan Levine’s CogDogBlog categorized under people, education, teaching and web2.0 and I can access the feed from any of these top-level folders. Also, when I read it in web2.0, it becomes marked as read in all the other folders too. 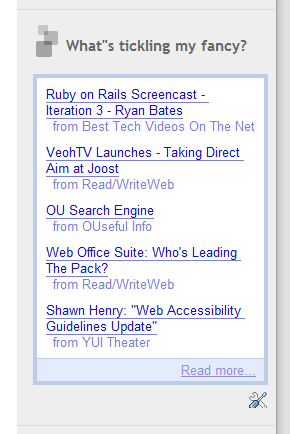 How you use Google Reader to read your RSS feeds is a matter of taste. For example, you can read the news from the home page in which case, Google essentially decides which news items to show you. An alternative is to use the tagged folders to browse the news and home in on the topics of particular interest. For example, I often home into the daily Dilbert cartoon by going directly to the cartoons folder. However, for efficiency, I find it best to go directly to the All items link. The All Items view gives a so called river of news view of all of my unread subscribed RSS feeds (here) arranged in chronological order (oldest first). In this view, you simply click on the first item and then use the space bar to move through item by item. As you do so, the items become marked as read. In this way you can efficiently catch up on a large number of RSS feeds without the need to use a mouse! So far as I know, only Google Reader provides this time-saving feature, and hence it’s become my feed reader of choice. This concludes Part 2! In the next article, I’ll show you how I try to be efficient in tagging items of interest.